Sophia Miller runs up the field. The senior defender and the Wildcats advanced to the Big Ten tournament semifinals with a 4-3 win over Rutgers on Sunday. With five minutes remaining in the Big Ten Tournament quarterfinals, Northwestern found itself moments away from elimination. Down a goal to Rutgers with the clock ticking, the Wildcats needed a hero. Junior midfielder Puck Pentenga scored in the 67th minute to tie the game, and junior forward Pascale Massey secured NU’s 4-3 victory with a go-ahead score less than two minutes later. The No. 4 seed Wildcats (14-5, 6-2 Big Ten) led for much of the game, but momentarily relinquished a second-half lead after the fifth-seeded Scarlet Knights (9-9, 3-5) scored consecutive goals to go up 3-2. But Pentenga and Massey kept NU’s title hopes alive, capping a dominant offensive display from the Cats. All four of NU’s goals began with penalty corners. The Cats earned 10 on the day, four more than Rutgers. The final score didn’t completely reflect NU’s attacking prowess. Though only one goal separated the two sides, the Cats outshot the Scarlet Knights 17-6 and controlled offensive play throughout. Though NU secured more scoring chances and penalty corners, Rutgers battled and capitalized on its opportunities, leaving the Cats in danger of being eliminated in front of their home crowd. If it wasn’t for the heroics of Pentenga and Massey, NU would likely be licking its wounds after a disappointing quarterfinal exit in the conference tournament. After the Scarlet Knights notched their go-ahead goal in the 62nd minute, Pentenga was visibly frustrated. She exacted revenge just five minutes later, powering a shot past Rutgers goaltender Gianna Glatz. Less than two minutes after the Pentenga equalizer, Massey tipped home a shot off a penalty corner to give the Cats their fourth and final score. Her team-leading 14th goal happened in a flash and was reviewed and confirmed by the referees before play continued — one of three video reviews during the game. In an act of desperation, Rutgers replaced its goalie with an extra attacker in an effort to tie the game in its dying moments. The Cats held strong on defense, in the process punching their ticket to East Lansing, Michigan, where they will face top-seeded Michigan (17-2, 8-0) on Friday. 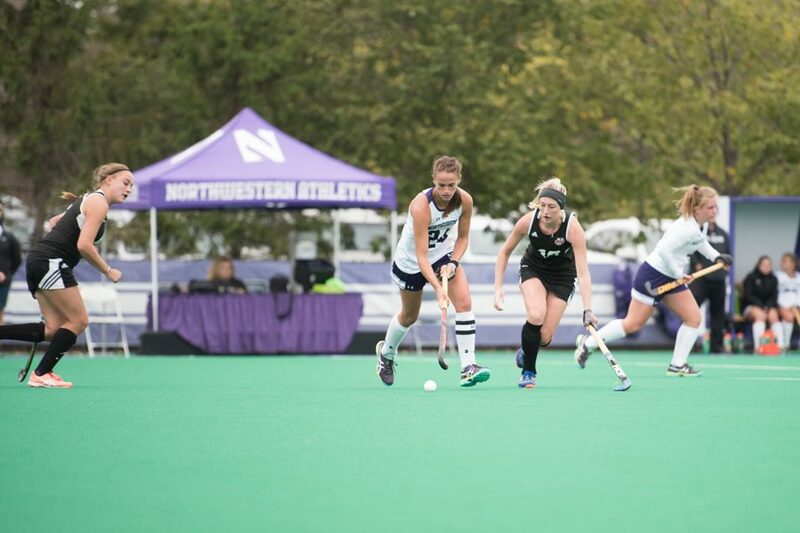 NU will look to avenge the 1-0 loss it suffered to the Wolverines just over a week ago in Ann Arbor. Michigan enters the match boasting a 14-game winning streak and will serve as the next roadblock on the Cats’ path to a conference title.